The island of Capri is located in the Gulf of Naples, South of the city of Naples and near the tip of the peninsula Coast in southern Italy. 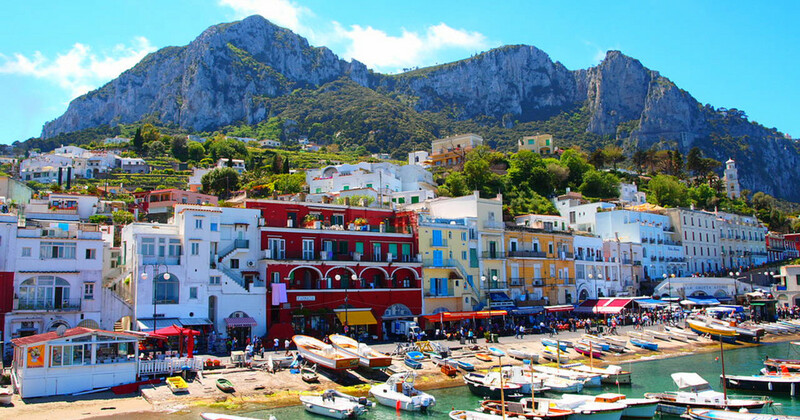 A visit to Capri is a highlight of a vacation in Naples and the Amalfi coast. Capri is a charming and picturesque Island made of limestone. Throughout history the island was a favourite from the Roman emperors, artists rich and famous writers, and still remains one of the must see places in the Mediterranean. Some of the main features of the island include the Marina Piccola (Marina), the Belvedere of Tragara (a high panoramic promenade lined with villas), the limestone rocks (the Stacks), the town of Anacapri, the Blue Grotto and the ruins of the Imperial Roman villas. The island is connected with frequent ferry and hydrofoil services for the city of Naples and Sorrento Amalfi Coast. These are the shipping companies that serve the routes to Caremar, Snav.